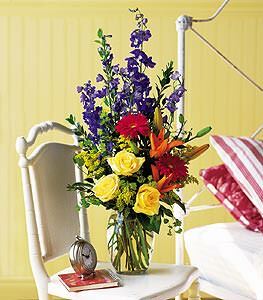 With its splash of yellow, blue and red flowers, this arrangement may be the most sensational way to tell someone youre thinking of them. Delphinium, gerberas, roses and lilies arrive in a glass vase. Vase may vary from item pictured.